This article is adapted from a longer online special report that includes videos and more content. To see the full report, visit reports.news.ucsc.edu/ethics-bowl. And, for more information, visit publicphilosophy.ucsc.edu. Twice a month from last September to February, UC Santa Cruz philosophy lecturer Kyle Robertson woke up early, dropped his kids off at school, drove north for one hour and fifty minutes, crossed the Richmond Bridge, and went to San Quentin State Prison. He was there to teach a course in Ethics Bowl—a nonconfrontational alternative to the traditional competitive form of debate—in collaboration with the Prison University Project (PUP). At the same time, he was also teaching an undergraduate course and coaching a team in Ethics Bowl at UC Santa Cruz. He soon suggested and arranged a very unusual debate between seven philosophy students from UC Santa Cruz and a team of prison inmates from San Quentin. It took place in the prison chapel—in front of an audience of nearly 100 inmates. The idea is to move philosophy away from the stereotype of the old bearded man pondering in the mountains and instead apply its principles to crucial problems we all face in today’s world. And in an era of intense partisanship, rabid fighting on social media, “fake news,” and “alternative facts,” the center promotes a new normal of how to talk about the really big issues confronting us today—in a civilized, rational, and much friendlier manner. Ethics Bowl is the opposite of traditional forms of debate in this country—the “win-at-all-costs,” negative, whatever-it-takes debate that is typical of cable news, congressional debates, election campaigns, and our courtrooms. Both Ellis and Robertson believe that traditional debate competitions, a well-established part of the U.S. high school curriculum since early in the 20th century, ultimately strengthen and reward one-sided thinking. “I think that the way we argue in courts of law, and in ‘forensic’ debate competitions, has undermined our ability to engage in the constructive debate that is necessary for democracy to function. Ethics Bowl, or something like it, could be a cure,” says Robertson, assistant director of the CPP, who earned a law degree from UC Berkeley and practiced for two years in Silicon Valley before earning a Ph.D. in philosophy from UC Santa Cruz in 2015. “Standard debate is reasoning with an agenda,” adds Ellis. “It is also what we find so corrosive in today’s politics. People have their favored view and then emphasize the information that fortifies their stance. Evidence that threatens their position is rationalized away, while problems for the opposing view are scavenged for, and then magnified. Robertson’s two-hour class for the Ethics Bowl debate at San Quentin covered topics such as moral theory and how to use ethics to justify a position in a case. But for the UC Santa Cruz students, training for the debate was a mixture of anxiety and adrenaline. As philosophy major Anna Feygin (Oakes ’18) notes, “It’s one thing to be forewarned about what to expect when you head inside a prison; it’s another to actually experience it. Third-year philosophy student Pedro Enriquez (Oakes ‘19) also had some concerns. But their fears were soon alleviated. The Ethics Bowl class and subsequent debate with UC Santa Cruz philosophy undergraduates affected the inmate participants in a variety of ways. Each had a personal reason for taking part in the debate, and afterward, most expressed a desire to participate in future Ethics Bowl debates. “I decided that it would be a great idea and learning experience to engage other students in some type of formal debate,” says inmate Randy Akins. “Just to be able to interact with the public made me feel whole again. 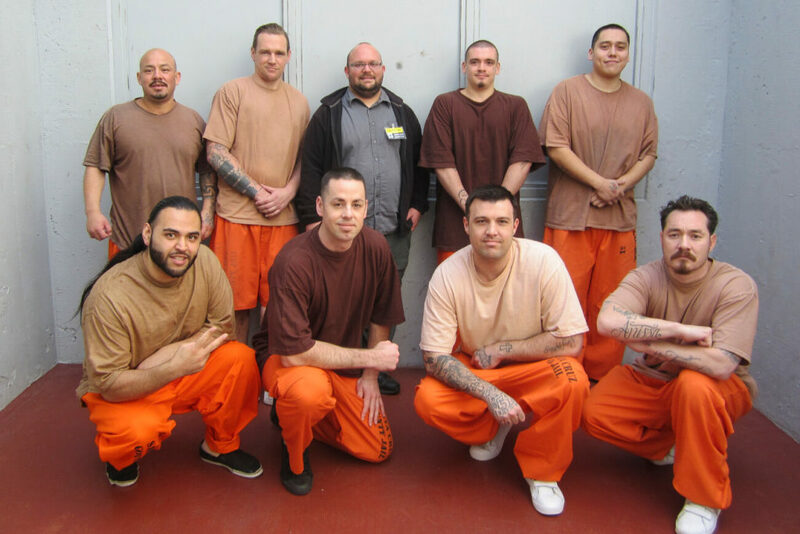 Above: David Donley (top row, center), philosophy Ph.D. candidate, with Santa Cruz County Jail inmates. Inmate Forrest Lee Jones had a different take on the experience. “I wanted to represent my team and demonstrate the knowledge I’ve been learning in the Prison University Project classes,” says Jones. “I’d never participated in a debate and wanted to experience its setting. There’s no shortage of contentious topics that can be debated in an Ethics Bowl—ranging from the Trump Administration’s “Muslim Ban,” to the use of military drones, to political discussion on social media, to the ethics of marital infidelity. But perhaps the most stirring thing for UC Santa Cruz philosophy professor Jon Ellis was how genuinely excited the inmates in the audience were by the excellent job the San Quentin team was doing at this particular exercise of fair-minded reasoning and open-minded listening. 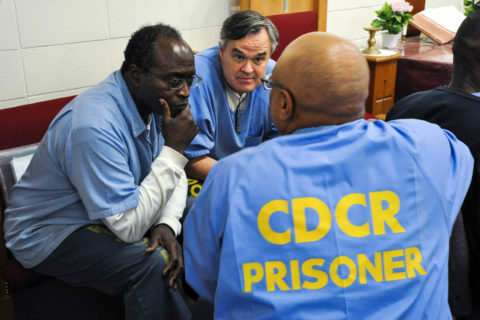 “There was an integrity there that really stood out to me, in the way that both teams—but especially the San Quentin team—engaged with the questions that were posed, showing a sincere respect for the complexities of the thinking and reasoning required by the difficulty of the issues,” says Ellis. Robertson says that he plans to co-teach a class this year with the Prison University Project at San Quentin, and that together they hope to hold future Ethics Bowls at San Quentin involving up to four new prison teams. He adds that the Center for Public Philosophy is also hoping to expand its outreach locally and host the first-ever Ethics Bowl in the Santa Cruz County jail system. “This type of event embodies the type of activity I value at the center for a variety of reasons,” says Robertson. “It reaches out to communities that are generally not included in our public deliberations about difficult ethical and political situations. The San Quentin inmates are often the objects of such deliberation, but rarely, if ever, participants.